Happy Halloween from Chou Chou Briard! She's been a busy therapy dog, going to her visits in her sheep costume. But first, she paid a visit to her vet, to cheer her up, and said goodbye to her physical therapist, who is moving. Even vets get sad and need a therapy dog now and then. Chou Chou's vet lost her young puppy in a tragic way: someone was careless while she was at work, didn't watch him, and the puppy was killed by horses on the property. We went unannounced. It was a busy day, and Chou's vet was on emergency duty. We sat in the waiting room, not interfering with her duties. After an hour or so, she walked by. ("And we surprised her!") Her face lit up. 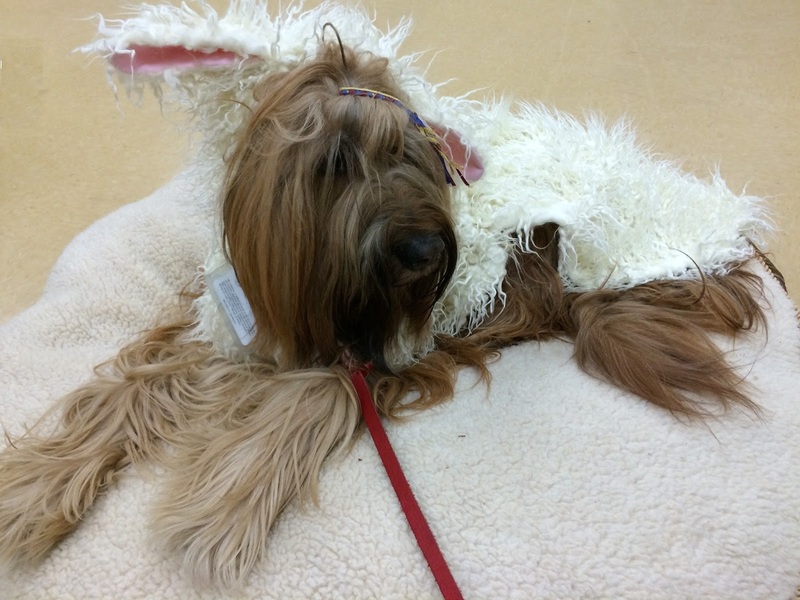 That's what a therapy dog ("in a sheep costume!") can do. Then lunch at a French bistro. Chou Chou and I sat at an outside table. We were meeting her physical therapy vet for lunch, to say goodbye. She's moving to New York for a career promotion -- Cornell Veterinary Hospital. Chou Chou saw her approach our table and jumped up to give a hug. ("She complimented my good hip extension!") We were having a nice lunch, but it was too hot on the patio for Chou Chou, and she was overheating! ... at the end of October! At night, it was time for Paws to Read -- therapy dog time at the library. In her sheep costume, she was a big hit and had many children crowded around her to read to her. ("I listened to 5 books at once! I am such a smart puppy!") Her costume ears got a little crooked from the kids petting her. The costume was made for Chou Chou by a woman who specializes in bridal couture. She creates beautiful dresses, and also teaches at the university. But she loves dogs, and she's a friend of mine, so she accepted the sheep costume assignment. No ordinary fleece for Chou Chou -- Kim found faux Mongolian fur. And she created those cute ears. Happy Halloween from a woof in sheep's clothing!